Over the last couple of decades, there have been some incredible technological advancements. What most people see are things like computers, smartphones, and self-driving vehicles as examples of this. But nearly every industry has experienced remarkable scientific breakthroughs. In the automotive field, one of the biggest game changers is ceramic coating. Taking advantage of nanotechnology, this amazing ceramic coating car paint protection solution is transforming the automotive game. Let’s take a look at how this incredible product works. Ceramic coating is a thin, hard coating layer that offers a huge array of features. 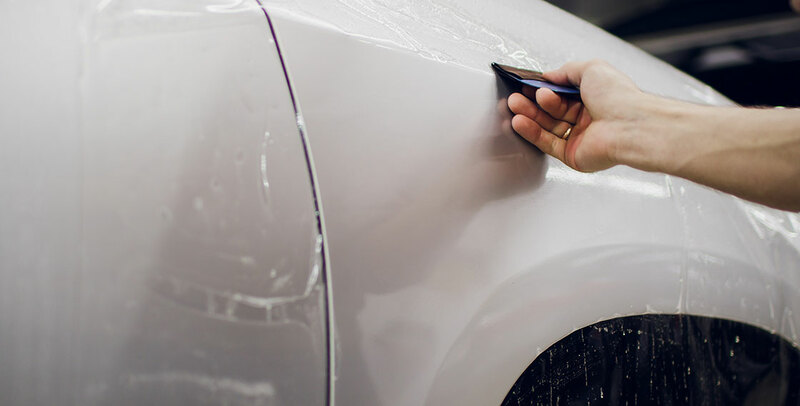 While it’s not going to protect your car if you hit a wall, it holds up extremely well against weathering and other debris that affect your car’s paint job over time. Modern Image offers two very special, one-of-a-kind ceramic coatings that “self-heal”. There are two versions, “Self-Heal Plus” and “Heal Lite”, both made by the company “Feynlab”. These coatings are extremely rare, and in fact, Modern Image is the only company that has them in San Diego. It’s like something from a Sci-Fi movie. You can watch the ceramic coating “erase” small scratches. What actually happening is heat depolymerizing the car coating, healing scratches in the process. There are so many threats to your car’s paint job. If you park too long in the sun, the paint fades. Chemicals can damage the exterior and penetrate the surface of your painted panels. In fact, even water causes damage over time. Ceramic coatings take advantage of “superhydrophobic” qualities that make water instantly release from the surface. Meanwhile, the UV protection is like the equivalent of SPF 1000 for your car. The final reason ceramic coating car technologies are rapidly growing in popularity is that they create the perfect finish on your vehicle that is easy to maintain. They will give your car an excellent glossy and slick appearance that will make it look ten times better than if you had just waxed it at the car wash. Not only that, the product is guaranteed to last 7 years and can be used across multiple surfaces of your car including the paint, wheels and more. Best of all, you don’t have to do much to keep your ceramic coating in great shape for years. In fact, because of its excellent properties, you will not need to wash your car as often because it’s designed to weather all the elements and always look good! These amazing coatings are a clear trend in the automotive market, and ceramic coating car costs are now more affordable than ever! That’s because many manufacturers from high-end rides like Tesla and BMW to even Ford and Chevy are now even offering some coatings of their models with this option. However, critics believe that these companies are just trying to monetize from the trend because most of the coatings they provide are not the highest quality, instead, they are basic paint sealants. So if you are looking to improve the look of your car and protect it from the elements, be sure to stop by a legitimate ceramic coating service. Our technicians can not only do this, but they assist you in a wide range of different exterior upgrades, including custom vinyl wraps, window tinting, and other vehicle protection solutions. Check out our website for even more of the great services we offer!